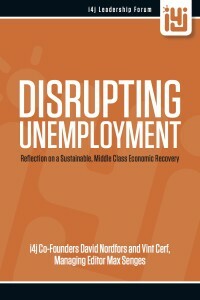 “Disrupting Unemployment” (on Am azon) by i4j co-founders David Nordfors and Vint Cerf, along with managing editor Max Senges published by the i4j Leadership Forum and the Kauffman Foundation, has been released. A job is a need. Innovation for jobs is a market. In the world’s existing, task-centered economies, the aim is to minimize the cost of tasks through innovation that helps customers spend better, yet–a growing paradox–with people in manufacturing or service jobs replaced by machines. But people need to earn in order to spend. In a people-centered economy, designed to increase the innate value of people, a job is a customer need, as in when people say “I need a job”–paid work with a steady, reliable income, enabling people to raise families and live a decent life. Employment is the standard way of satisfying the customer’s need for a job, but innovation is opening many more possibilities. There is a market for innovative companies to offer customers good jobs where they earn better, in more meaningful ways. Thus what is widely seen as a current problem becomes instead a powerful, emerging opportunity for entrepreneurs: to transform underused human capacity into wealth distributed much more widely and evenly. Five billion customers want a good job. 200 Million have one. Of the five billion world citizens of working age, three billion want to work; most of them want a steady job, but barely a billion have one. Of these,, only two hundred million (13%) are ‘engaged’ (meaningfully involved) in their jobs. For every engaged worker, two hate their jobs and the rest are indifferent. This sad world workforce creates $75 trillion of market value (GDP) each year. “Disrupting Unemployment” postulates that innovative companies can help everyone find a job that matches their skills, talents and passions, teamed with people who engage them, finding mutual opportunities for what they do best. How much more value would five billion well-matched, inspired people create vs. today’s two hundred million engaged workers accompanied by four hundred million angry ones? A doubling in world GDP ($75 Trillion) is a conservative estimate. Add to that the increased well-being of people having a job and a team that engages them. Innovation Dynamics: Analytics Based on Big Data and Network Graph Science—Implications for Innovation for Jobs (i4j) Initiatives, by Daniel L. Harple, Jr.